As a Recipient, there may be times when you need to switch signer responsibility from yourself to another person. Maybe the sender sent the document to the wrong person, or you do not have the authority to sign the document. This can easily be remedied if you access the document and switch signer responsibility by entering the information of the new signer. As the signer, you will need to first access the document by opening your inbox and finding the invitation email from the sender. It should look something like this. When you access the signing page, go to the top left and under More, select Change Signer. 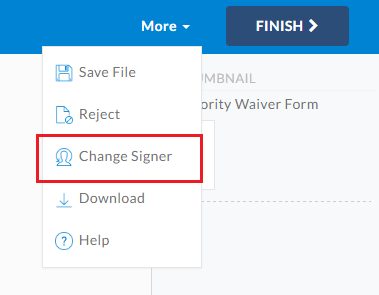 In the prompted window, switch the name and email to the new signer and then click Change Signer. The page will reload with the document open, but there will be no tags visible to you. 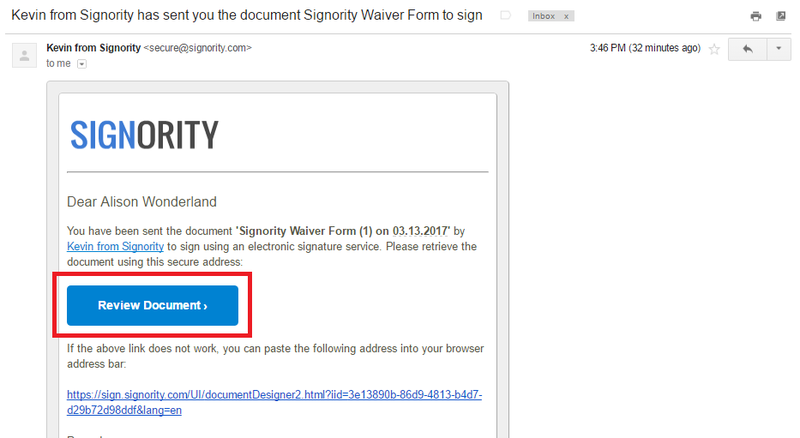 The new signer will now receive an invitation email in their inbox, and your original invitation will no longer be valid. You can click on the Review Document button and view the document itself, but you will not have signing capabilities anymore. The new signer can complete the document and they will receive the finalized document. If you’re the sender, you can find more information on how to do this process for the signers here. As the sender, you’re able to change the signer responsibilities and information directly from your account.